Dumas Wesley’s 3rd annual Plane Pull is Saturday, May 5. Teams will compete to see who can pull an Airbus A320 more than 12 feet in the shortest amount of time. Registration/gates open at 9 a.m. and the event begins at 10 a.m. Includes entertainment, food trucks and a kid zone. More information at www.dumaswesley.org. Rainbow Mobile presents its first monthly LGBTQ Family Dinner for Mobile County on Thursday, May 3, 6:30 p.m. at Chili’s Grill & Bar, 790 Schillinger Road S. First Thursday of every month. Please RSVP no later than one day prior at www.rainbowmobile.org/mobile-family-dinner. Outdoor market is hosted by city of Fairhope on Thursday, May 3, 3-6 p.m. and will continue each Thursday until July 19. Local farmers, bakers, fresh local produce, fresh-cut flowers, local honey, plants and more. Fairhope library will host children’s activities at 4 p.m. Call 251-929-1466. Friday, May 4, 6-9 p.m. at History Museum of Mobile, 2018 Griot Award recipient and Pulitzer Prize winner Cynthia Tucker will be honored. Purchase tickets at www.dffaaht.org. Come join us Friday, May 4, 3-5:30 p.m. at the Ben May downtown library for an afternoon screening of “Rogue One” at 3:30 p.m. DIY lightsaber instructions, Star Wars 3D printing projects and more. Dressing as your favorite Star Wars character is encouraged. Call 251-208-7079. Spanish Fort residents will have an opportunity to “Tidy the City” starting Friday, May 4, at 8 a.m. through Sunday, May 6, at 8 p.m. at Spanish Fort Community Center. Two dumpsters will be placed behind the center in the cul-de-sac for the collection of unwanted items. Find us on Facebook @cityofspanishfort. The Gulf Coast Hot Air Balloon Festival will feature hot air balloon rides, balloon glow Friday and Saturday nights, World Famous Disc Connected K-9 Frisbee Dog Show, carnival rides, arts and crafts vendors, food, live music and more. Friday, May 4, at 2 p.m. through Sunday, May 6, at the Foley Soccer Complex. General admission is free. Visit GulfCoastBalloonFestival.com. Gulf Coast Exploreum will host “Jedi Physics” with Dr. Albert Gapud of the USA Physics Department. A free viewing of “Return of the Jedi” will follow in the IMAX theater. General admission is $10 for adults and children. Capacity is limited; purchase tickets at www.exploreum.com. Amelia Leonard will discuss the importance of development screenings and how they help with early detection of developmental delays that may indicate a child is on the autism spectrum. Saturday, May 5, 10 a.m. to noon at the Ben May Main Library. Call 251-208-7079. Come shop at the second Market in the Park of the spring/summer in Cathedral Square on Saturday, May 5, from 7:30-11 a.m. The market features one-of-a-kind arts and crafts produced by local artisans, as well as locally grown produce, seafood, cheese and eggs, honeys, flowers and plants, baked goods, pasta and more. Follow us on Facebook @SpecialEventsMobile. Come to Mobile Botanical Gardens MarketPlace (located at the end of our parking lot) and get some great plants for your garden on Saturday, May 5, at 9 a.m. Plant experts will be on hand to answer any questions and give advice. Visit www.mbgrebloomshop.com. The Mobile Museum of Art’s first ever Cuban Festival will celebrate the shared cultures of Mobile and its sister city, Havana, Cuba. Events begin at 10 a.m. on Saturday, May 5, with tours and book signing. Free admission for all Mobile County residents all day. Experience special exhibits, vintage Cuban cars, food and dance. Visit www.mobilemuseumofart.com. A special screening of the PBS series “The Story of the Jews with Simon Schama” at Bernheim Hall at the Ben May Main Library on Sunday, May 6, at 1:30 p.m. Call 251-208-7079 or visit www.mobilepubliclibrary.org. 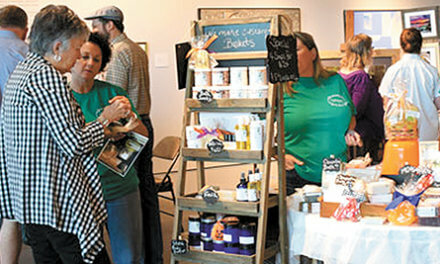 Enjoy a fun afternoon of local makers, bakers, crafters and artists at The Pillars on Sunday, May 6, beginning at noon. Live music and local food. Free and open to the public. Family fun and pet friendly! Junior League of Mobile will host a Community Collaborations breakfast on Monday, May 7, 7:30 a.m., with guest speaker Vicki Clark at the JLM headquarters, 57 N. Sage Ave. Free; seating is limited so pre-registration is required. Call 251-463-9342. Please join the Mobile County Young Republicans for a debate between the three district court judge candidates on Tuesday, May 8, at 6 p.m. at Dublin Pub & Eatery. Candidate meet and greet starts 6 p.m. Find us on Facebook @MobileYR. Each Thursday Mobile Botanical Gardens will remain open until 7 p.m. Come out and enjoy a late afternoon stroll or just sit and watch the sunset. Last admission is at 6 p.m. Visit www.mobilebotanicalgardens.org. 13th annual fundraiser for the Dauphin Island Sea Lab Foundation on Thursday, May 3, 6-9 p.m. at Bluegill on the Causeway. Silent auction, hors d’oeuvres and drinks with music by Johnny Hayes Duo. Tickets $50 in advance/$55 at the door. Contact Helene Hassell, 251-605-6624. Fun, family event at the Grand Hotel Marriott in Point Clear on Saturday, May 4, hosted by the Alabama Chapter of the American Academy of Pediatrics. Participants will have five events — biking, kayaking, fun run/walk, swimming and reading. Proceeds benefit the Reach Out and Read-Alabama program that provides books and a foundation for success for Alabama’s children. Find us on Facebook @AlabamaChapter.AAP. Join us at The Battle House Hotel on Sunday, May 6, at 2 p.m. for a tea benefiting the Salvation Army’s Family Haven, the only family shelter that accepts men, women and children as a unit. Arts and crafts, tea time refreshments and special princess guests. Tickets cost $50 per pair and $15 for each additional child 12 and under, $35 per adult. Call 251-459-6144 to reserve tickets. Don’t miss the inaugural Mobile Hobby Horse Derby hosted by Delta Dogs in Cathedral Square on Sunday, May 6, at 1 p.m. Hop on your hobby horse, dress in your best race day costume and compete to be “top dog” in Mobile. Register online at eventbrite.com. Late registration is online only through Friday, May 4, at 5 p.m. There will be no registration at the event. Rock ’n’ roll music has always been a reflection of the times, and the new Gov’t Mule album, “Revolution Come…Revolution Go,” is no exception. Gov’t Mule with special guests Black Stone Cherry on Thursday, May 3, at the Saenger Theatre. Tickets at the Saenger Box Office, Monday-Friday, 10 a.m. to 2 p.m. or at ticketmaster.com. Last chance to see Theatre 98’s “Butterflies are Free” by Leonard Gershe. Showtimes are Friday, May 4 and Saturday, May 5, at 7:30 p.m. and Sunday, May 6, at 2:30 p.m. Visit theatre98.org for pricing information. America’s premier comedian, Jerry Seinfeld, will return to the Port City to perform his signature stand-up routine at the Saenger Theatre this Friday, May 4, at 7 p.m. Purchase tickets online at www.ticketmaster.com or call 800-745-3000. The Christ Church Cathedral Choir will present the iconic Requiem in D minor by Wolfgang Amadeus Mozart as the finale to their 2017-2018 Music Season on Sunday, May 6, at 4 p.m. This is considered Mozart’s most mysterious work, commissioned by a secret patron and left unfinished at the time of the composer’s death. Free and open to all. Corner of Church and St. Emanuel streets. Enjoy free concerts in the Pavilion at Town Center Park in Spanish Fort every Friday. Mitcher Rencher, steel drum artist, will perform at 6:30 p.m. on Friday, May 4. Visit spanishforttowncenter.com for the summer lineup. Take an adventure back in time 290 millions years when bizarre-looking animals dominated life on land and sea. The Exploreum will display this traveling exhibition thru June 3. Visit exploreum.com. In the vastness of the Pacific Ocean, there is a paradise unlike any other: the Galapagos Archipelago. Immerse yourself in this spectacular film at the Exploreum until May 26. Visit exploreum.com. Join us for half-day boot camps composed of workshops providing hands-on instruction in the tools used by today’s digital marketer on Friday, May 4, 7:30 a.m. to 12:30 p.m. at Mobile Area Association of Realtors (2827 Airport Blvd.). Visit twww.southalabama.edu/colleges/mcob/digitalmarketing/bootcamp.html. Join us at the Mobile Botanical Gardens MarketPlace to learn more about native and local insect-eating plants, where they grow and how you can take them home with you. The workshop will be held Saturday, May 5, at 10 a.m. and include a presentation about carnivorous plants and their ecological companion plants, what makes a bog a bog and how to construct a bog garden. All materials are included in registration fee; MBG members $65, nonmembers $75. The Daphne Public Library will provide a CPR class on Saturday, May 5, at 9:30 a.m. This course is open to students in grades 6-12 and adults free of charge. The class will cover adult, toddler and infant CPR. To register, call 251-621-2818, ext. 211. Gates open at 6 p.m. Wednesday, May 2, for the BayBears’ first game of five against the Chattanooga Lookouts at Hank Aaron Stadium. Games begin nightly at 7:05 p.m. through Saturday, May 5. Last game is Sunday, May 5, at 2:05 p.m. Log on to mobilebaybears.com for tickets or call 479-BEAR (2327). The best teams from the fastest-growing NCAA sport will hit the sand with an 8-team bracket for double-elimination competition. Tournament runs May 4-6 at Gulf Shores Main Public Beach (101 E. Beach Blvd.). General admission day passes cost $20; $30 for courtside seating day passes; $45 for general admission all-session; $75 for courtside seating all-session. Visit GulfShores.com/NCAAWomensBeachVball.aspx for details. The Alabama Department of Transportation will open the Bankhead Tunnel for for bicycle and pedestrian traffic on Saturday, May 5, from 6 a.m. to 8 a.m.
AFC Mobile soccer team takes on the New Orleans Jesters, the biggest team along the Gulf Coast, on Saturday, May 5, at Lipscomb Stadium, 7 p.m. The Jesters went undefeated in the Southeastern Conference of the National Premier Soccer League. Now they head to Mobile to participate in the biggest and highest-level soccer match to ever take place in the Port City. Visit @AFCMobile on Facebook for details and the 2018 schedule. Join us Saturday, May 5, from 8 a.m. to 3 p.m. at Alabama Youth Sports Combine for a fun, family-friendly event for one and all. See some great competitions and learn a little about jiu jitsu, too. Register now at www.fujibjj.com. Register during the early registration period to receive a $10 discount and a promotional item. Recharge and refresh with Yoga at Alabama Contemporary Art Center. This free one-hour class on Saturday, May 5, at 11:30am is led by certified yoga instructors and open to participants of all levels of experience. Join us for Rainbow Mobile’s first kayaking trip at noon on Sunday, May 6, at Off the Hook Marina. We will have both single kayaks and dual canoes for rent for $20 each. Launch fee is $3 per person if you want to bring your own. Check us out on Facebook. Dauphin Island Town Council: First and third Tuesdays at 7 p.m., 1011 Bienville Blvd.,www.townofdauphinisland.org. Gulf Shores City Council: Second and fourth Mondays at 4 p.m., 1905 W. First St.,www.gulfshoresal.gov. Mobile Planning Commission: First and third Thursdays at 2 p.m., 205 Government St.,www.urban.cityofmobile.org. Orange Beach City Council: First and third Tuesdays at 5 p.m., 4099 Orange Beach Blvd.,www.cityoforangebeach.com. Prichard City Council: Every Thursday at 5:30 p.m., 216 E. Prichard Ave.,www.thecityofprichard.org.